Married happy hikers would be more correct today. 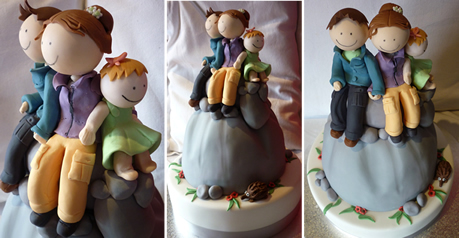 I delivered this cake yesterday to a venue 30 minutes south and up a long long very steep and bumpy gravel road. Happily there were no mishaps and the hikers got their cake in tact. From thoughts of Norway it's back to Australia and how Australian is making lamingtons. 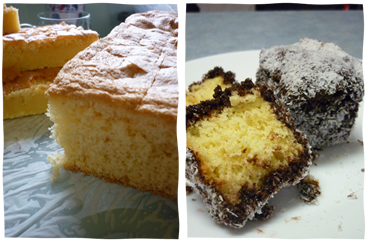 Actually it's probably more Australian to buy lamingtons from Coles as they are actually quite tricky to make - really! Our first batch is there on the left on the left behind the nice fluffy looking cake - they didn't rise at all and were so rubbery they could bounce. Take 2 was better (it turned out I needed to whisk rather than beat the eggs, and do it for twice as long) - and the end result was delicious. Zali made lamingtons almost by herself a few weeks ago and I must say her first try was somewhere between take 1 and take 2 today - so I'm even more impressed with her efforts now. The other exciting thing about last weekend was of course the Huon Show. I was delighted to win the decorated Christmas Cake first prize, and the froggy cake was 2nd in the special occasion cake section which was cool. Most excitingly was Jon's cake, which, after leaving a trail of kitchen mess, took out equal first prize in a big field. So cool! Our floral efforts were not quite so successful though - but hopefully the kids still thought it was fun to exhibit. Today was quite a day. It started at 1am when I was still awake after a close basketball game that only started at 10pm the night before. Then at 6am I had to get up to go for a paddle. At 11.30 I left work and scootered up a long hill to get to Zali's swimming class on time. I was back at my desk, still very sweaty by 2pm. I put in a whole 1 hour and 50 minutes of work before scooting off to the car and then to mum's to meet Jon, the kids, the cakes and the flowers which were bound for Huonville Show's Hall of Industries. Luckily we could leave the mess behind. We made it to Huonville with a whole 10 minutes to spare before entries closed. Jon was excited to discover that the 'Cake Made By A Male' section was very popular this year. His twitter feed describes his day of baking. And now we're home again we've just got to pack for a busy weekend. Although compared to today it will probably feel quite slow! The bit of cake decorating that I like the most is the 2nd last bit, where all the bits come together to make the final product. It normally takes way less time than the rest of the process and the result is generally really satisfying. The very last bit is delivery and normally that is just a pain! Anyway - this is my 2nd cake destined for the Huon Show. It's called 'Kiss Me'. This is my Christmas Cake entry for the Huon Show on the weekend. It's called 'Two Turtle Doves' just in case you were wondering what the ducks were for. Last year it looked like the cooking section could do with a few more entries so I'm entering a couple and hopefully Jon will get a chance to put a cake in the 'Chocolate Cake Made By A Male' section tomorrow. Anyway I'm really happy with this design and how it progressed from the paper design to the final cake. Jon will be happy with it too as it's got about an inch of marzipan on it to give it the height I wanted! 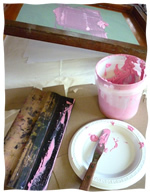 And on the topic of hankering to do things, I've had a hankering to do some silk-screening for months now. Apart from the end result, I really love the physical process of cutting a stencil for silk screening the same way that I really like carving out a lino-cutting. Anyway I was lucky enough to pick up Tracy's nan and pop's old silk screening gear when I was in Sydney recently and it's been sitting around tantalisingly whilst I've been getting on with cakes and work and family things. Today though I was up early and actually got it up and running and it was fantastic! The frames are better than I could possibly buy or make and one was even in such good condition I was able to just get out some paint (saved from a course I did when Jett was a baby) and have a go. I'll be doing it again soon I recon but I've only got one colour though- so everything I do is going to have to be pink for a while! I was going to say that this where I was at 6.30am today as it sounds so impressive but the camera actually timestamped the photo as being at 7.11am today - although we had been kayaking for a while before I actually I took the photo so it is still a little bit impressive - especially if you knew the week I'd had! Basically it started with running a cupcake course last Tuesday requiring 140 cupcakes to be made, then I lost my voice. Then having regular work for the rest of the week with Jon going away for the weekend and cake stuff flowing over and keeping me up until after midnight every night since Friday. Then when you add to that some sad family news with grandfather passing away on Saturday it's really been quite a fortnight. And I don't really think it will all start to calm down until after Friday what with the funeral and all. So this moment felt like a little bit of light and breathing space amongst everything else. I was paddling with my friend Mark (whose family we are organising some orienteering events with) who provides the kayaks, gear, lifting power and motivation to actually get down to the meeting spot at the agreed time. We were paddling in Browns River in Kingston and you can just see the start of the mountain ahead on the right although I like to think the sky is so blue and the water so calm it could have been the middle of the day in Sweden in summer, or even in the canals around LA (as seen in Californication), or somewhere in a lake in the Algonquin in Canada. 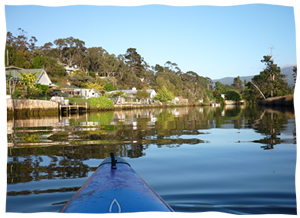 The reason I'm kayaking is to make myself the most popular girl in town by becoming skilled enough to tackle the kayak legs in the Freycinet Challenge next year. Given my dodgy ankle (stankle) and the fact that I don't have an aversion to paddling in fact I quite like it - I think it's the way to go for the immediate future anyway - and if it provides moments like these then it's already proving to be a good option. Busy Busy Busy. 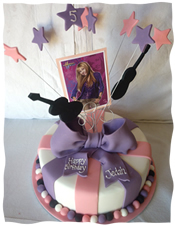 This is a cool cake though! 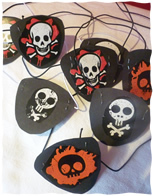 Ok.. so I suppose some of you are thinking that I"m getting into this pirate party theme a bit tooo much. Well don't be worried.. 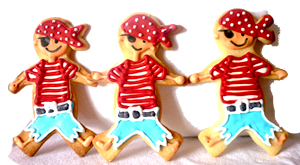 I only did a couple of other pirate things this week.. like um.. pirate biscuits..
oh and the Pirate-Dice-of-almost Certain-Doom (and I got second mate Zali to assist me with that..) . Yep that's about it really. 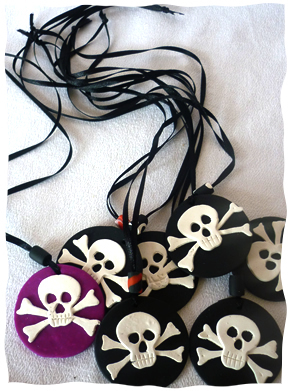 Oh except for the Fimo Pirate Medallions - but I did them months ago so that doesn't really count.. There's the invitations in bottles, the treasure chest and the cake, which of course you know about already.. so they don't count... and it's not like I did any thing else.. nup. Well except for the Pirate Eye Patches.. but this was really a case of trying to avoid paying $15 for equivalent party shop plastic crap, when we had wrapping paper, black cardboard and elastic already at home.. So.. Like I said, no need to worry about me - I'm perfectly fine.. 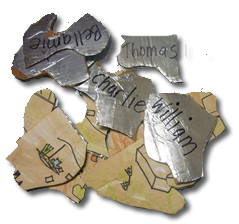 I've just got to hide the pieces of this Pirate Map I made and then I can dash out to the library.. seeya..
Treasure chest : Check, Map: Check, Eyepatch: Check, Skull and Crossbones: Check, Sword through Cake: Check... This is actually my first ever pirate cake and I'm pretty happy with it. 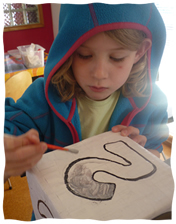 Jett chose the colour scheme and told me which bits of cakes he liked from a selection of googled cakes. I did have to persuade him to let me use red on the cake as well as the blue is almost a bit dowdy for my liking.. 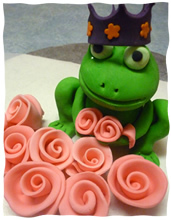 I've been doing some 'development' stuff for the next cakewoman course - Kids Cakes. I'm liking the frog idea but I really should go to bed. In other news, Jon is a big TV star now and he's gone to Sydney to seek his fortune. - I've just checked it out and it's about a second long in the 21st minute of the Collectors on ABC. Don't blink. This week has been very musically themed. Firstly there was a Hannah Montana birthday cake and then as part of my WideAngle job, I had to host a music video making seminar with Aria winner Josh Logue and Darren Cordeaux from Kisschasy. It was very cool but a lot of work and it wasn't over until late. That was followed the next night by a Tasmanian music video competition that I had to assist with (the winner was this very cool entry). I also had to squeeze in 3 days of actual office work and lots of other stuff. I'm exhausted. It's been a busy busy fortnight but the end is almost in sight. 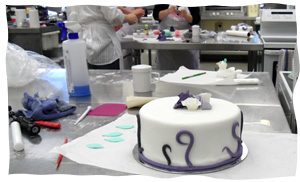 Last Saturday I ran the first CakeWoman Cake Basics course - (as opposed to cupcakes) and it went really really well. Could have done with a few more students in order to actually make a profit, but I enjoyed it and I'm pretty sure the students did too. 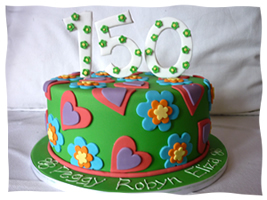 The next course up is Children's Cakes which will be similar but with more a a kiddie theme (brightly coloured icing etc etc). 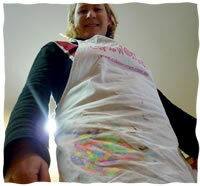 By the end of yesterday's baking fest (I also made a lot of cakes for the Cake Basics course running on Saturday) - My formerly white apron made it look like I had spent the day butchering clowns.